﻿ How To Deal With Bad Online Reviews » Red Mango Marketing! Before someone buys something, goes to a store, or books a reservation, it’s likely they’re going to search for the business online. In fact, nearly 95 percent of shoppers read online reviews before making a purchase. The words a customer leaves in a review may seem harmless, but it can have an impact on your business. Reviews can help grow your business and customer base, but can also ruin your reputation and chase customers away. You probably already have a business strategy that includes having business insurance, a marketing plan, and ways to expand your business. An equally important part of that strategy should be managing customer reviews. If your business doesn’t have any online reviews, that’s just as concerning as having a ton of negative reviews. Displaying your reviews not only lets people learn about your business, but it can lead to more business. The numbers show that online reviews can increase conversion rates by 270 percent, while not replying to customer reviews can mean a 15 percent increase in customer churn. Despite your best efforts to keep every customer happy, it’s not always going to happen. If a customer leaves your business a negative review, one of the worst things you could do is not reply. In a 2016 study, 16 percent of participants expected businesses to reply to negative reviews within three hours. A separate study found 70 percent of customers changed their opinions after a business replied to feedback. No matter how negative the feedback is, it’s important to engage. How you reply to a customer’s review is important. Your response tells a customer that you listened to their issues and want to make things better. Just saying, “Thanks for your feedback,” can come off as disingenuous. Thank the customer for visiting your business. Apologize for the experience they had and emphasize that’s not what your business is about. In some cases, you can offer a special discount or sale for the customer. It shows you truly care about them as a customer and want to make things right. If you get a customer review that isn’t specific or is broad, you should still respond to it. Keep some of the points above in mind; thank them and apologize. Tell the customer that you want to hear more about their experience to make things right. Take the conversation offline. Ask them to contact you or tell them someone from their team will be in touch. Hi, thank you for visiting our store. I’m sorry you had a longer than expected wait time. That’s definitely not the experience we strive to give our customers. I’d love to make things right if you give us another chance. Please give me a call at 123-456-7890. After making things right with the customer, don’t be afraid to ask a new review or to update their initial feedback. To other customers, this shows you took the time and effort to resolve the issues. In your years of business, you may also come across trolls. These are people who leave negative reviews or feedback on your pages to try to rile you up. Follow the same advice above in your initial response to them. Thank them, apologize and ask for more information. If they don’t want to talk with you offline and continue bashing you and your business, you don’t have to respond. Other people will see you responded to their initial review and offered to help. If they don’t take you up on your offer, there’s not much you can do. If someone leaves a review that you can tell was from a troll, you definitely don’t need to respond. No photo, not using a name or ranting about something unrelated to your business are some of the ways you can tell if a troll left a comment. Chances are if you can tell a review was made by a troll then other people can tell too. If you continue receiving negative feedback or reviews from the same troll, you can report them on the review platform. Or in extreme cases, you could ban the person from leaving any reviews on your business’s page. Sometimes asking customers for a review or feedback can come off as a bit pushy. There are ways to ask your customers to provide feedback without being aggressive. If you have a customer’s email, you can also reach out to them a day or two after they interacted with your business. With an email template, you can craft a personalized message to the customer. Be sure to thank them for their business in your email, and make it as easy as possible for them to click through to your review site. You can also provide an incentive. Whether it’s offering a special discount code or a free product, it could encourage a customer to leave a review. Online reviews are what help consumers decide if they want to support your business. Even if you have a balance between positive and negative reviews, it’s important to respond. This shows people you’re interested in your customers. And it shows you value their input and you’re willing to make the effort to make things right if there are issues. Log into your Constant Contact account to create an email template for collecting online feedback. 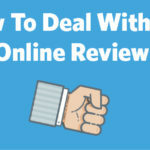 The post How To Deal With Bad Online Reviews appeared first on Constant Contact Blogs. This entry was posted on Friday, March 22nd, 2019 at 8:00 am	and is filed under Business Tips, Fresh Insights, News & Updates. You can follow any responses to this entry through the RSS 2.0 feed. Both comments and pings are currently closed.